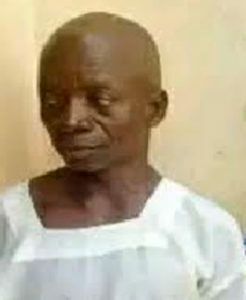 A 16-year-old girl (names withheld) is allegedly carrying a seven-month-old pregnancy for her 56 years old father, Prophet Taiwo Oluboyode, in Odode, Idanre area of Ondo State. Vanguard gathered that the suspect, who owns a white garment church and currently in police custody, allegedly informed his interrogators that he was tempted by the devil to commit the act. Findings in the town showed that the cleric is popular and his church, located at Oke-Ijebu Street, Odode, Idanre, always records high traffic of miracle-seeking worshippers from far and near on a regular basis. Sources close to the church revealed that the prophet is a specialist in bathing women in streams to ward off evil spirits and those tormented by spiritual husbands, who prevent them from getting married or having babies. Reports had it that the prophet lives alone with her daughter after the wife left him years back. It was learned that efforts by the estranged wife to take her daughter along with her were rebuffed by the suspect, who insisted he needed her around to run errands and take care of him in the interim. A family source hinted that the suspect had refused to remarry after the wife left and had preferred sleeping with his daughter instead. It was unclear if the victim raised any alarm over her defilement by her father, but neighbours said that the girl was always keeping to herself. Vanguard learned that the victim stopped going to school when signs that she is pregnant was becoming evident. Her school mates, who came to the house to ask after her, were informed by the father that she had travelled to Lagos to continue her studies. It was gathered from police source that when the victim took in and informed the suspect, he allegedly gave her some concoctions to terminate the pregnancy. The attempt, it was learned, failed. The church is presently under lock and key, ýwhile other leaders and members of the church have gone underground for fear of arrest. Police spokesperson, Femi Joseph, promised to get the details from the DPO in Idanre, but had not done so at press time. However, police detectives at Ala Police Station in Akure, confirmed that the cleric had been arrested and would soon be prosecuted.